Update: This summer, one of SGGC’s activities, “School Ground Community Design Workshop” was listed in the International School Grounds Alliance Activity Guide. You can check out the full guide here. “I love putting my feet in the soil…it makes me feel closer to the Earth.” -Dyer Elementary student. 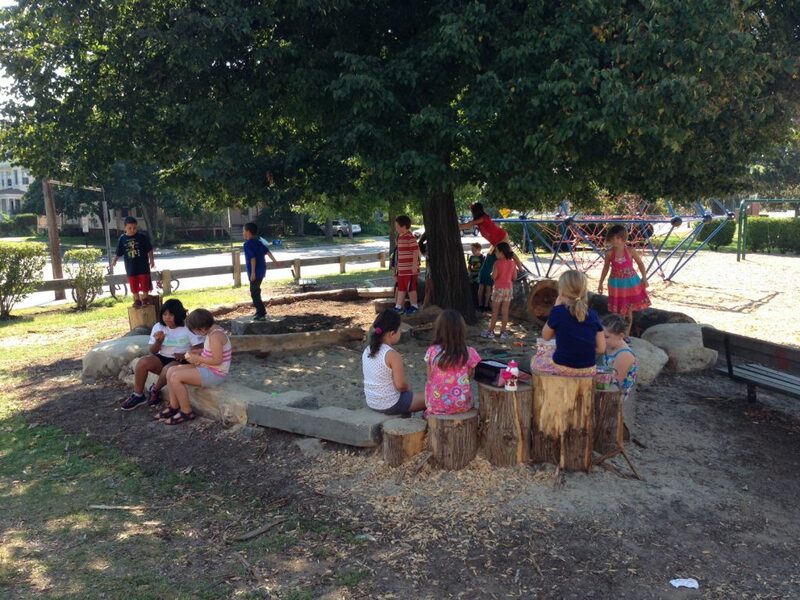 For the School Ground Greening Coalition, Nature Play is not just a buzzword. Outdoors, in natural settings, children learn important lessons about risk, resilience, and self-sufficiency, and develop a sense of scientific inquiry. They play in more complex and creative ways around trees and plants and “loose parts” like dirt, sand, sticks and pinecones and pebbles; meanwhile, the multitude of sensory offerings provided by nature—including that muddy puddle filled with worms—directly impact the quality of child brain development. It is no wonder that forest kindergartens, where children typically spend the entire school day, year-round, outside, continue to grow in popularity. There is a movement to give back what rightfully belongs to the growing-up years. Over just a few generations, long-range outdoor free play has all but disappeared from childhood experience. Scheduled activities, digital media, and helicopter parenting are key factors, but the additional reasons are many, complex, and varied. Problems resulting from this nature deficit include anxiety, depression, ADHD and other mood-related and behavioral issues. But the restorative effects of nature are well-known; even hospitals have invested in green spaces to speed post-op recovery. Not surprisingly, the planning and design of streets, neighborhoods, parks and school grounds have impacted children’s access to nature. This is where the School Ground Greening Coalition has strategically focused our work, because we know children spend hundreds of hours on their school grounds. Young, preliterate children learn in large part through the environment in which they play and interact. Children are natural scientists, constantly seeking to experiment with things, to build and touch and smell. The richer the play environment, the richer the child’s learning experience, and this continues to matter as children move through primary and secondary school. However, many school grounds are sterile, limited to equipment that is mostly for physical development, and lacking in other features that support complex learning through play. 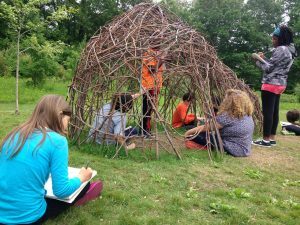 Older students need places with nature for respite too, and we’re proud to say we have projects this year are at Lyman Moore Middle School, Portland High School, South Portland High School, and PATHS. Supported by research and design information from across the country and globe, the SGGC has worked, alongside K-12 staff, students, and parents who seek guidance in providing more natural environments on school grounds. We have offered mini-grants and logistical support, as well as connections to design professionals eager to help. The projects have ranged from school trails to green playground features (hills, plants, trees, boulders, logs, paths) and gardens. We know from our years of community workdays, classroom design charettes, and interactions with schools that these places really make a difference in how children learn, play, socialize, and feel about their school. When you hear a student asking his teacher if he can bring home a carrot to show his parents, you know his experience in the garden had meaning and value. We encourage you to do your own research of Nature Play online and on the ground! Check out the results of our collaborative work any time of year – at Dyer and Skillin Schools in South Portland, East End Community School on Munjoy Hill, Nason’s Corner Park/Breakwater School, or at many other schools in greater Portland. Learn more about the School Ground Greening Coalition at trails.org/our-work/schools. “How children lost the right to roam in four generations”, by David Derbyshire, Daily Mail. PreviousPrevious post:Trail to Ale Run/Walk (Maine Today)NextNext post:Pretty flower or a gnarly pest?